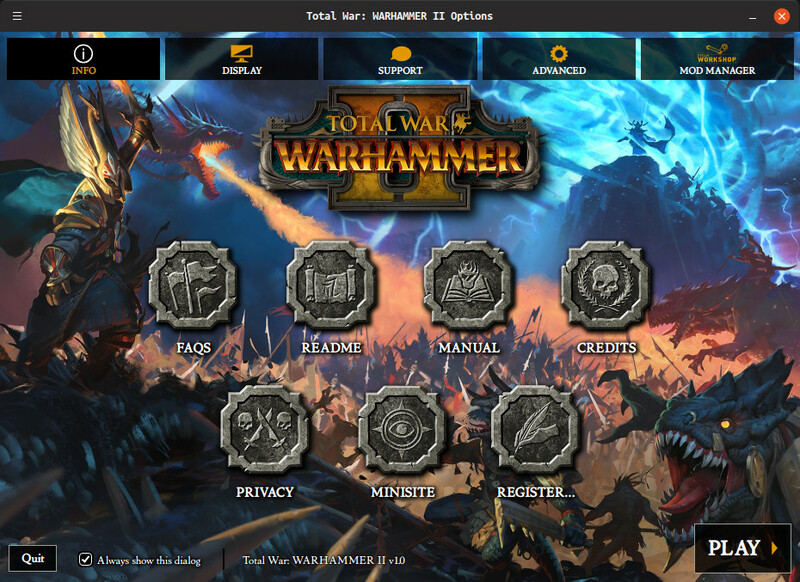 Originally developed by Creative Assembly and published by SEGA, Total War: WARHAMMER II is another Linux port from Feral Interactive. Arriving on Linux a little over a year after the Windows release, it's another game to use the Vulkan API on Linux. This also marks Feral’s 24th Linux port (27th if counting standalone expansions). This is actually the second game in a planned trilogy, with Total War: WARHAMMER II offering up a new narrative campaign. If you own the first Total War: WARHAMMER, you can grab the Mortal Empires free DLC which enables you to battle across a huge combined campaign map which stitches both games together. That sounds really rather exciting! It’s quite a popular game, with it regularly hitting well over twenty thousand people and so having it on Linux and officially supporting is a great thing. I’ve spoken to Feral Interactive, who confirmed that sadly again the online multiplayer is only for Linux and Mac, it will not work with Windows. Hopefully in future Feral will be able to work with developers even more closely to make fully cross-platform multiplayer a thing. As expected, it comes with the Feral launcher styled appropriately to the game. It looks good, it's functional and I personally find it quite useful. Being able to pick a screen to display the game on and resolution before you load a game is really nice. I know some people groan about launchers, but I think when done as well as they are for Feral games, they're more useful than annoying. Some benchmarks are up next. All done at 1080p with the NVIDIA 415.13 driver. Worth noting that while Feral's system requirements state it was tested on the 396.54 driver, they did say "or better". Also, when maxing out the settings, the game does warn about "Shadow detail" being set to "Extreme" being likely to cause some performance problems. Not something you should really do, unless your machine is an absolute power-house. Just including that for fun to see how it levels out at the very top. Ubuntu 18.10 versus Windows 10 benchmarks. Done on the same hardware, both installs up to date. On the Windows 10 side, the NVIDIA 416.94 driver was used. The DirectX mode was picked as 11, since DirectX 12 support for it on Windows is only classed as a beta, so we are comparing properly released states. In terms of performance, it seems Feral have done a really good job overall. 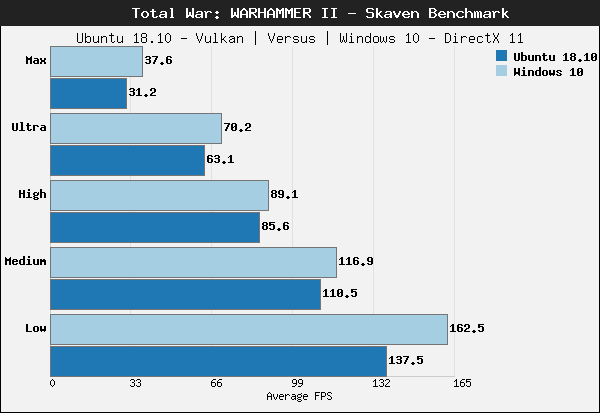 They really know their stuff now and their work with Linux ports and the Vulkan API seems to be paying off to give us some well performing Linux games that can be enjoyed by many. Looking over Windows benchmarks other people have done, it's looking very close. As for the gameplay and the campaigns on offer, I won't step on the toes of our contributor BTRE who will do it justice, but it certainly seems quite interesting. After going through a rather pretty intro video, the initial campaign load time on a HDD was quite long at 2-3 minutes (seems to be much faster on an SSD according to BTRE). Thankfully, loading the first battle took half the initial game loading time. Once in, testing myself in the campaign on Ultra everything seems to be really smooth, not even the slightest hint of stutter seen. After a solid hour+ it's not given me any issues at all. Very happy with the Linux port, I'm not usually one for Total War games but even I'm quite impressed. You can pick up a copy from Humble Store, Feral Store or head directly to Steam. Well I dont play such boring games so I just did a test run. I have a GTX 1080Ti , I am playing @ 2560 x 1440 with ultra settings. While playing a lot of graphic artifacts jump out of the soldiers, lets say that are textures jumping around my screen. It takes a lot of time to load in a non SSD DISK. I played for 10 mins and almost fall asleep , I really want to know what is the big deal of such games? Is just your random group of soldiers fighting another random group of soldiers just clicking the attack button while arranging the positions of your troops. Can't say anything about the rest, but this bit is normal. Games don't usually make many draw calls during load screens, they only do so to update the progress bar which happens even less frequently on an HDD. Quote I’ve spoken to Feral Interactive, who confirmed that sadly again the online multiplayer is only for Linux and Mac, it will not work with Windows. Hopefully in future Feral will be able to work with developers even more closely to make fully cross-platform multiplayer a thing. I'm very disappointed in this port. 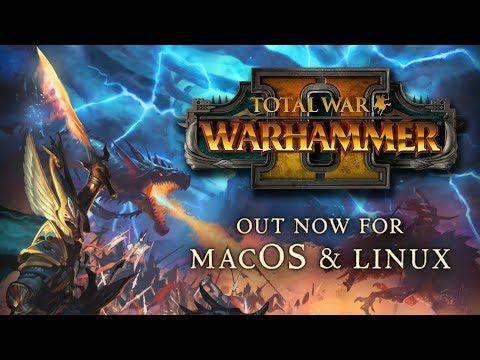 I've played a decent amount of both Total War Warhammer 1 and 2 on Windows, and I have been looking forward to playing this on Linux for many months. The fact that it's not cross platform is a deal-breaker for me. A massive portion of the gameplay involves playing with others online, and if you're restricted to playing with just Linux players or the paltry mac community, It already takes a while to get a multiplayer game on Windows filled up, and with Linux being as small of a market as it is I foresee this being a huge problem. Given that Feral was originally planning this port for "early autumn" and it's just coming out now, they've had plenty of time to work on the game and with all the experienced developers they have I don't see how they can't manage to fit cross-platform play into their products. There are plenty of big games (Rocket League, Stellaris, Dota2, Borderlands 2, RUST, etc) that work cross-platform, and while the single-player for TW:WH2 is good, the vast majority of replayability for me is online multiplayer/campaigns. I don't think I will be purchasing another Feral game until they confirm it will be cross-platform. This always gets raised by someone, but as new people join it bears repeating: this is beyond Feral's control. There are technical reasons why they can't provide cross-platform for these titles. The problem is actually with the Windows release, and Feral are highly unlikely to be able to touch that. Technical reasons can include things like random number generation on Windows being different to any *nix platform, or some of the floating point math differing from compilers, or networking middleware being unavailable. In the latter case, even Creative Assembly might not know what goes on internally with networking - if they use middleware, they'll get a binary blob to link against and an API interface to use, and that's it. "Watching the wire" is not feasible. There _are_ Feral games that are cross platform. They do try if possible. But the fault is really with the original Windows development that doesn't use anything suitable, and their unwillingness to change to something that does. Don't get me wrong, I'm not saying don't make it a deal break or anything like that. I understand people wanting cross-platform play, and won't buy a game without it, although I guess that locks you into Windows effectively if you want to play the game - in which case you can still buy it from Feral, you'll still get a Windows version with your purchase, but buying from Feral means it's a GNU/Linux sale rather than a Windows one. Just blame the right people for lack of cross-platform, is all. That's a fair point. I was venting my frustration because a large portion of the game is online, and being Linux/Mac only could mean a long wait time between games, as well as not playing with friends who own it on Windows. You're right that I shouldn't be blaming Feral. I'm just upset at the situation more than anything else. Tell you what, the first person to donate any amount to any open source project and post the receipt gets a copy of this game purchased directly from feral. I would prefer running it with proton and Cross Plattform. A port or natural game is better, but not if cross plattform is missing. For me, that's a big issue. Not Ferals fault, maybe and sad for Feral themselves off course. raverrebel Even if I would've wanted the game, the missing crossplay would hinder me from playing with friends.. Really hope that crossplay will be implemented for future ports (I know it's hard and sometimes impossible). Just tell them that it's a good reason to try Linux! It's free! Lol! No! It is not free. It costs them time. And if you have friends that do not care for IT and just want to play, they just won't switch to Win. And the argument: "Multiplayer-Games on Linux can often not be played with friends on Windows. So please install Linux!" is really weak, isn't it? It is like: "Try a new OS, it gives you problems when you want to play with others on Win. But no matter, you can Dualboot and maintain two systems in your rare spare time...."
einherjar I would prefer running it with proton and Cross Plattform. That's why I put "LOL!" at the end. I totally know it's not that easy, else Linux market share would already be much higher. I just exploited a "cliché". I am slightly confused. I played a lot of TW:Warhammer I on my machine without problems, although AMD cars are not supported at all (based on Steam Store sys.requirement page). TW:Warhammer II requires AMD GPU's - Mesa 18.1.5 or better, but it also states it needs 2GB AMD R9 285 (GCN 3rd Gen) or better. After starting the game/launcher, I get an error message, that my system is incapable of Vulkan rendering on current hardware. Is that because of only 2nd Gen Radeon graphic card, or should I be installing additional packages?